Fantasy owners have patiently awaited the return of Josh Gordon for their postseason runs, but should you start him this week against a strong Bengals pass defense? By now, your fantasy league has no doubt entered the postseason, where roster decisions are amplified in an elimination setting. Whether your league does its playoffs in a one or two-week format, even the best fantasy player is just a few poor starts or sits away from elimination, no matter how solid your team has been all year. With injuries, teams fighting for NFL playoff spots, guys playing for contracts and other teams that have flat-out given up, there's a ton to take into account when choosing a starter this week. Obviously, you start your studs. As the saying goes, you "dance with the girl you brought to the prom," so now is not the time to bench DeMarco Murray in favor of a guy with a better matchup. But, for all those guys on the fringe, here are your playoff start'ems and sit'ems. In most 10-12 team leagues, Ryan has been a solid starter, but this week brings a rare trifecta for fantasy quarterbacks: A great matchup, the potential to play from behind and a home game in a dome. If the Falcons fall behind Pittsburgh, as most predict, Ryan could end up throwing it 50 times, and with the Steelers' secondary struggling against top flight receivers (they just gave up over 200 yards to A.J. Green, while winning by 21), Ryan should be able to find nicked up Julio Jones against whichever mediocre DB replaces Ike Taylor's corpse this week. Morris has been a solid, but unspectacular performer for fantasy owners this year, sitting in that limbo of "I gotta start him, but I'm not exactly thrilled about it." Well, get excited about Morris this week, as Washington travels to face a Giants team surrendering over 20 fantasy points per week to opposing backfields. Morris has gotten at least 18 touches each of the last seven weeks, so the workload will be there, and with the Giants getting steamrolled by opposing ground games, you should expect a solid return in the 100-yard, 1 TD rushing, 2 receptions for 30 yards range. While many fantasy owners gave up on Jackson when rookie Mike Evans turned into a must start, the savvy veteran has re-emerged in recent weeks, notching 100-yard receiving performances in two of the last three weeks. Last weekend's performance against Detroit was remarkable, as Jackson grabbed 10 balls but, more importantly, was targeted 17 times. With Josh McCown again expected to start for the Bucs, look for another Jackson-heavy day in the Tampa passing game. Wait a minute, Flacco is facing the crappy Jaguars and fighting for a playoff spot, why should I sit him? Well, the Jags are actually decent against opposing QBs, surrendering just 16.6 points per week in standard scoring leagues, but awful against the run, surrendering 22.2 points per week to opposing backfields. Look for the Ravens to feed Justin Forsett and build a big lead, then ride him some more to close things out against a decimated Jacksonville front. For all of you that fell for the "Bishop Sankey is going to be a good fantasy back" lie, then continued to start him because he was the only serviceable option in the Titans backfield: For the love of God, bench him this week. Tennessee goes into Sunday with nothing to play for, but the Jets are sorta fighting for their quarterback/coach (even though they're both doomed), and the only thing Gang Green does well is defend the run (allowing the 24th-most fantasy points to opposing backfields). Add in the uncertainty of the quarterback situation (Zach Mettenberger is doubtful and Jake Locker may make his first start in 10 weeks), and you know the Jets are going to be loading the box against the one thing the Titans do only sorta terribly. Fantasy owners held onto Gordon throughout his lengthy suspension, hoping that the uber-talented receiver would give their team a shot in the arm come playoff time. 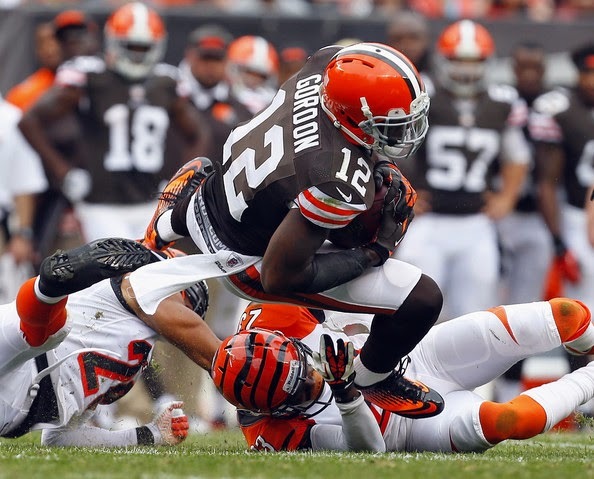 Well, Gordon had a solid return, catching 8 balls for 115 yards, then followed that up with a 7 reception, 75 yard performance the following week. But last week's 2 catch, 15 yard stinker against a soft Colts secondary raised some eyebrows, and reminded us all that Gordon still doesn't have a touchdown or a 30-yard catch in his three games back. With the Browns breaking in Johnny Football against a stingy Bengals secondary (2nd-fewest points surrendered to opposing fantasy wideouts), it's probably better to go with more of a known commodity during this fantasy playoff weekend.